FLIP BACK-FOUR TOOLS IN ONE. THE CHANNEL IS 2" LONGER THAN THE WASHER. 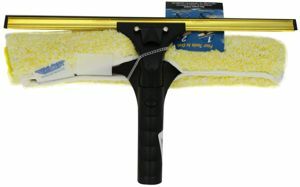 WITH THE SIMPLE TOUCH OF A BUTTON TRANFORM THE FLIP BACK FOR A VARIETY OF APPLICATIONS: A ONE PASS SQUEEGEE, COMBINATION SCRUB AND SQUEEGEE, OR A HEAVY DUTY WASHER AND QUICK RELEASE SQUEEGEE. EACH TOOL FITS ON ALL ETTORE EXTENSION POLES. THE ONLY TOOL THAT WORKS IN FOUR TIME SAVING COMBINATIONS WITH NO PARTS TO LOOSE.